Headquarters: The main headquarters of SSC is situated at New Delhi and it has sub-regional offices at Allahabad, Mumbai, Kolkata, Guwahati, Chennai, and Bengaluru. Tier I: Tier I will be an online exam and the candidates clearing this phase will be shortlisted for Tier II. Tier II: Tier II will be an offline exam and the candidates clearing this stage will be shortlisted for Tier III. Application: The SSC CHSL 2019 Application form will be available from 5th March 2019 until 5th April 2019 in the Official SSC website. Exam: The SSC CHSL exam dates 2019 will be from 4th March to 26th March 2019. Results: The SSC CHSL 2019 exam results will be announced on 1st June 2020. Check SSC CHSL 2019 Important Dates to know more about SSC CHSL exam dates, admit card release date and results. Candidate can be a subject of Nepal or Bhutan. A candidate can be Tibetan Refugee who came to India before 1st January 1962 with the intention of permanently settling in India. A person of Indian origin, who has migrated from Pakistan, Burma, Sri Lanka, East African countries of Kenya, Uganda, the United Republic of Tanzania, Zambia, Malawi, Zaire, Ethiopia and Vietnam with the intention of permanently settling in India. Age-limit: The candidate applying for SSC CHSL exam 2019 should not be more than 27 years of age until the date of application. However, relaxation in upper age limit will be provided for candidates from reserved categories. The candidate applying for SSC CHSL 2019 should have passed 10+2 from the recognized board/university or an equivalent class. Candidates applying for the position of data entry operator in the Office of Comptroller and Auditor General of India (C&AG) must be 12th Standard pass in Science stream with Mathematics as a subject from a recognized Board or equivalent. To know more about eligibility, go to the SSC CHSL 2019 Eligibility section. Availability: The application form for SSC CHSL exam 2019 will be available from 5th March 2019 to 5th April 2019. Application Process: The SSC CHSL 2019 application can be divided as registration, form filling, uploading, and payment. Candidates belonging to reserved categories (SC/ST/OBC/PWD) are exempted from paying the application fees. Female candidates, as well as Ex-Servicemen, are also exempted from paying the SSC CHSL exam fees. Fee payment: Candidates can pay the fee through SBI Challan/Net banking and any credit or debit cards. Candidates photographs must be more than 30 kb and less than 50 kb with a resolution of 100-pixel width and 120-pixel height. Candidates signature must be more than 1 kb and less than 12 kb with a resolution of 140-pixel width by 60-pixel height. The signature must be uploaded in jpg format. Request for change/correction in the Application Form will not be entertained under any circumstances. Know more about the registration form in the SSC CHSL 2019 Application Form section. Visit the official SSC CHSL website. Candidates who meet the SSC CHSL 2019 eligibility can register for the exam. Next, fill all the required personal and educational details. Upload scanned copy of recent photograph and signature in the required format. Make the payment in the online/offline mode. Before submitting, candidates are advised to check the application form properly and then click submit. Know more about process for applying in the SSC CHSL 2019 Application Process section. Mandatory: The Admit card must be downloaded and the print out should be carried to the exam centers without fail. Click the admit card link. Next, choose the region, and click on the region's link to access the admit card. Enter required details like roll number and date of birth. Admit card page will be displayed. Download and save the admit card. 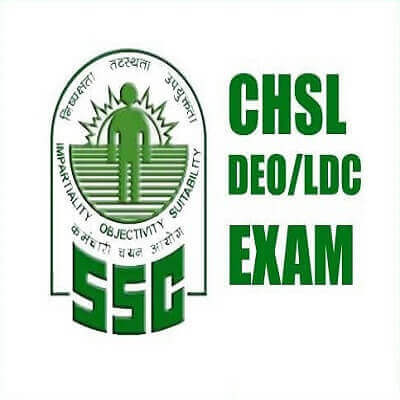 know more about hall ticket in the SSC CHSL 2019 Admit Card section. Date: The SSC exam results will be declared separately for all three Tiers and it will be notified by the SSC committee. Process: The candidate has to clear all the three tiers of the CHSL exam to complete the recruitment process. Click on the latest updates. A pdf file will open with the results as per the registration numbers. Download the PDF and Take the printout for future reference. Know more about the results in SSC CHSL 2019 Results section. The SSC CHSL Cut Off will be released by the Staff Selection Commission (SSC) every year. The candidates have to qualify the SSC Cut Off 2019 to advance to the next rounds for the selection. For more information, please feel free to go to the SSC CHSL 2019 Cut Off section. SSC CHSL exam pattern is different for three tiers. Candidates should clear all three levels to get selected. Tier I: Computer-Based Written Exam - Objective Type (Online Exam). Tier II: Written Exam - Descriptive Paper (Offline Exam). Tier III: Typing Test/Skill Test. A minimum of 33 % to qualify for the tier 3 exam. Requirements: Data Entry Speed of 8,000 Key Depressions per hour on the computer is required. Duration: The duration of the said Test is about 15 minutes and printed matter in English will contain about 2000-2200 strokes. Final Merit: The final merit of the candidates would be determined on the basis of the total score obtained by them in Tier-I and Tier-II rounds. To know more about the exam pattern, please feel free to go to the SSC CHSL Exam Pattern 2019 section. Job Profile: The SSC CHSL 2019 will be conducted for the post of Lower Division Clerk, Court Clerk, Postal/Sorting Assistant and Data Entry Operator. Vacancies: The SSC CHSL 2019 official notification is yet to be released and the committee may declare around 3259 Vacancies. The below table shows the vacancies in 2017-18 and 2016-17 respectively. To know more about vacancies, please feel free to access the SSC CHSL 2019 Vacancy section. Stages: Candidates will have to clear all the three exam tiers in SSC CHSL 2019 order to be appointed to the post of their preference. Pay scale: A Lower Division Clerk (LDC)/ Junior Secretariat Assistant (JSA) will be offered a Level 1 payment of INR 5200 to 20200 and grade pay of INR 1900. Promotions: The SSC promotions will include the increment of Rs 2800/- for each promotion. To know more about the recruitment, please feel free to go to the SSC CHSL 2019 Recruitment section. Q: What is SSC CHSL exam? Combined Higher Secondary Level (CHSL) exam is conducted by Staff Selection Commission (SSC) in order to recruit candidates for the posts of Lower Divisional Clerk (LDC)/ Postal Assistant (PA), /Junior Secretariat Assistant (JSA), / Sorting Assistant (SA), and Data Entry Operator (DEO). Q: What is the expected vacancy in SSC CHSL 2019 exam? Q: How to download the admit card? Candidates can download the admit card by visiting the official website and duly entering Roll number and DOB (Date of Birth). Computer-Based Written Exam - Objective Type (Online Exam). Written Exam - Descriptive Paper (Offline Exam). Q: What is the age limit to appear for the exam? Q: What is the frequency of SSC CHSL? SSC CHSL exam is conducted only once a year. Q: How to apply for SSC CHSL 2019? Q: What is the SSC CHSL 2019 Application Fee? Candidates should pay Rs 100 /- as CHSL exam application fee. To appear for SSC CHSL candidates must have passed 12th Standard or equivalent examination from a recognized Board or University. Yes, there is negative marking and 0.50 marks is deducted for every wrong answer. Q: What is the age relaxation for reserved categories? There is age relaxation for reserved categories and candidates can refer to SSC CHSL 2019 Eligibility section to know in detail. Q: What is the mode of SSC CHSL 2019 exam? Tier I (Objective Type Exam) will be conducted in online mode and Tier II (Descriptive Type) will be conducted in offline mode. Results: The results will be officially declared by SSC on 1st June 2020 on SSC website. Age limit: The candidate should not be more than 27 years but for reserved category and physically disabled relaxation of age is permitted. Physically disabled: The physically disabled candidates will be provided with the relevant post. Availability: The SSC CHSL 2019 Application form will be available on the official SSC website. Mode: The SSC CHSL 2019 is available only through online(official website ) and is not available in offline mode. Payment: The candidate needs to pay the prescribed application form fees through net banking, credit/debit card. The eligibility criteria are to qualify and clear SSC CHSL examination.